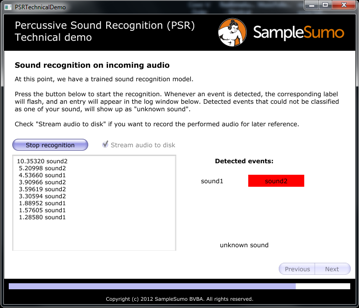 SampleSumo's Percussive Sound Recognition (PSR) engine is a middleware package that analyzes incoming audio (for example from a microphone input) and listens for occurrences of pre-defined percussive sounds. The PSR engine is available as a C/C++ library with documentation, development guide and example code. We currently support Windows, MacOSX and iOS (let us know if you would like to use it on other platforms). Contact us for more details, pricing info or an evaluation license to get you started. Game credits: Karlijn Koning (team lead, artist) Dieter de Baets (tech lead, programmer) Rick de Water & Carsten Frentz (programmers) Bart Geels, Monica Pranoto & Janice Tirantautama (artists) Nils Desle, Robbie Grigg & Ronny Franken (supervisors).